You wanted to know, so here it is! 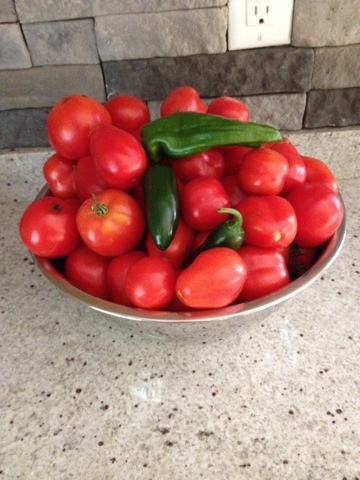 I had a ton of tomatoes left over this year in the garden, as usual. I don't know what happens but I sswear to God that these suckers pop up over night! Last year I canned just tomatoes and still have two jars left over so I figured that I'd do something different with them this year. I've been making Chicken Salsa just about every week and Josh loves it, so instead of buying the crappy stuff, I decided to make my own. I grew green peppers, jalapenos, squash, zucchini, and green beans. The credit for my garden goes to my husband. It is supposed to be "my" project but I totally forgot about it and honestly didn't quite care about it this year.....until now. Thanks Babe! 1. Blanche tomatoes and then "pulse" in food processor until you get them to the consistency that you like. I like chunks, so I only pressed the button 3 times. 2. Cut onions and peppers into small pieces. 3. Add all ingredients into a large pan and bring to a boil. Boil and reduce until half the original amount (about 1 hour). 4. Before filling jars, make sure the lids and jars are sterilized. I made a water bath and had them on a low boil for an hour. 5. 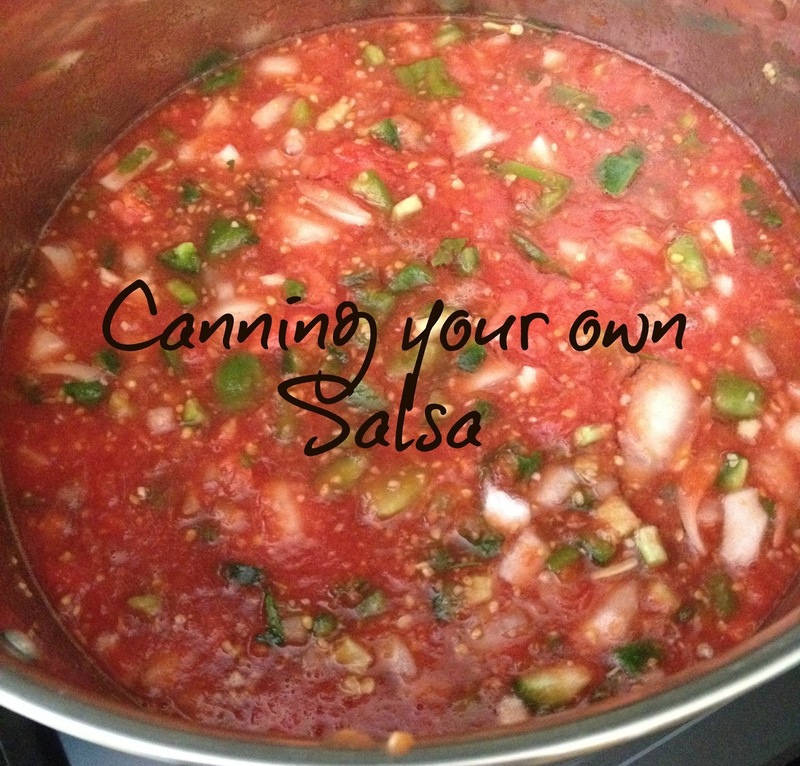 Pour hot salsa immediately into the jars leaving ½” space on top..
6. 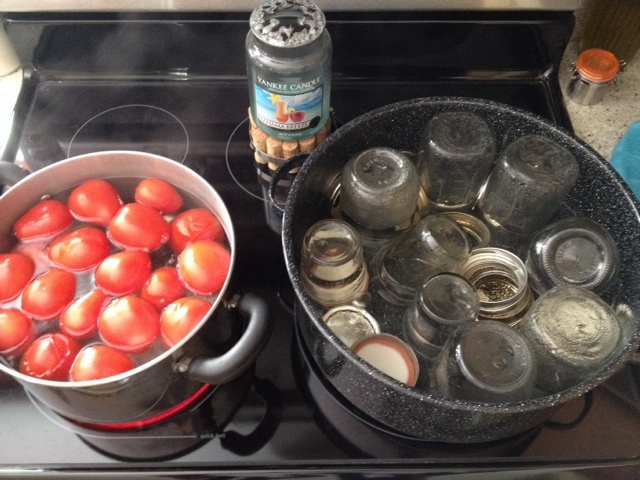 Put lids on jars and seal tightly, using a cloth to hold the hot jars. 7. When done filling jars, go back and retighten previous jars. 8. Then get a hot bath ready and leave each jar in the bath for 20 minutes. 9. Take the jars out of the water bath and leave on the counter until cool and the lids "pop". This recipe came out amazeballs. I keep getting in trouble for handing out jars to friends and family! I used some TJ's double roasted salsa for chips on football Sunday and it sucked compared to this! I'm all about the chunky salsa! And have been searching for a homemade recipe...this looks delicious! I'm about to have a huge wine cellar with lots of dosage space and I've never tried canning. This looks like a great Trevor to stay with. Thanks for sharing!